William Turner, born in 1920, is one of the last of the great living Northern Industrial painters — who belonged to the circle of artists who surrounded and were influenced by L.S. Lowry — Alan Lowndes, Kenneth Gribble, Theodore Major, Harold Riley etc. Lowry followed a personal vision, little influenced by the works of other painters. 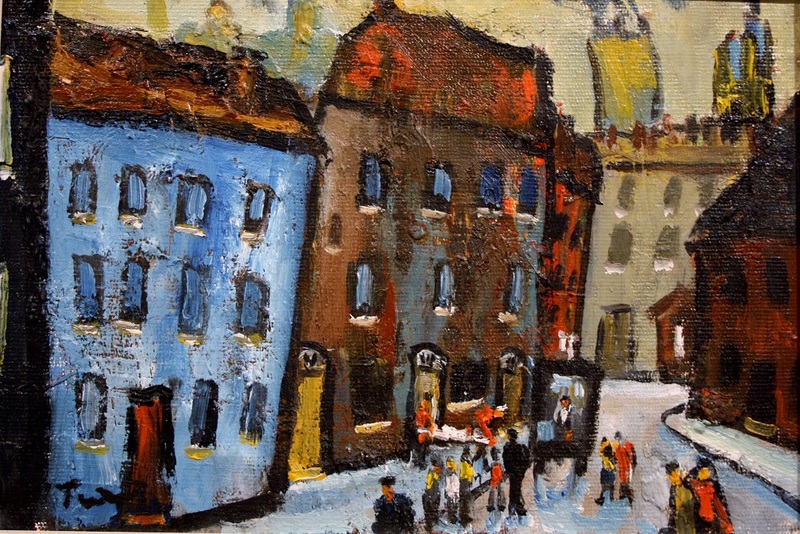 William Turner, however, in the fifties and sixties was a regular visitor to the exhibitions held at the Crane Kalman Gallery, Manchester, where he absorbed the works of the German Expressionists and the French Fauves particularly Beckmann, Vlaminck, Soutine, Chagall, Rouault, Segonzac. He re-interpreted their colours and techniques and applied them in a very personal way to the industrial landscapes of the N.W. of England. For over fifty years Turner has painted the industrial landscapes of the North-West, depicting images of towering cotton mills, pre-clean-air-act skies, smoking chimneys and swarming humanity struggling to survive amidst the industrial chaos. But always there is a lyrical quality in his works, an empathy with his subject matter; there is never any stiffness in his compositions — his rows of terraced houses, his cotton mills, his public buildings and his viaducts sway and lean in all directions. In a dark industrial valley, his mills are often painted red, yellow, blue or orange, helping to alleviate the grim reality of what he is depicting. We also see evidence of his amazing imagination and wide-ranging subject matter — distorted images of individual figures or of groups, individual images of cinemas, theatres, pub interiors, small terraces of houses, grimy northern streets, a milkman with his horse, rag and bone men, a road sweeper, two children playing, then the spectrum widens to vast panoramas of the Stockport Valley with the viaduct in the background or of the huge mills of Manchester, Stockport and Salford. Turner depends for his scintillating creations on his amazing memory — he can re-create on canvas a street scene, an industrial canal or a view from fifty years ago with such accuracy that the older generation can instantly identify the scenes. This remarkable gift has enabled him to record the times through which he has lived, the fast-disappearing industrial landscape of the 19th and early 20th century and to evoke amongst viewers a feeling of nostalgia for things past. It is essential that such a painter should be given the fullest recognition and that his works be preserved for posterity. Turner’s work is more and more widely collected and is in the collections of Sir Peter Ustinov, Sebastian Coe, Eddie Shah, Freddy Pye, Stockport Art Gallery, Saab Motors, Manchester Education Committee and throughout the world.